Vitaminds® is an apothecary style gift container filled with 30 daily motivational messages, printed on durable, laminated key-tags. Vitaminds® was created to inspire and motivate people, and encourage them to be conscious, and aware of their internal dialog on a daily basis. 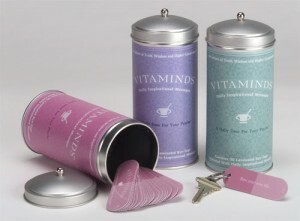 Each container of Vitaminds® contains 30 motivational messages, a month’s supply, printed on durable, laminated key-tags. The messages on each key-tag are concealed with a removable-adhesive sticker to maintain the integrity of the “one Vitamind® per day” philosophy. Once the sticker is removed and the message is read, it can then be saved on your key chain for inspiration throughout the day, month, or year! 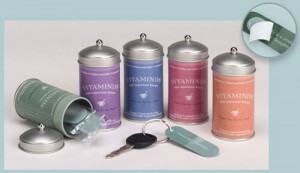 Each key-tag is part of a numbered Vitaminds® volume. The whole set can be saved on a key chain, or put back in the reusable, decorative container for future reference.